PCD Pharma Franchise in Chhattisgarh – Chhattisgarh is one of the best State of India for setting up Pharmacutical business. There is hub of pharma companies that deal in manufacturing and supply the pharmaceutical drugs. 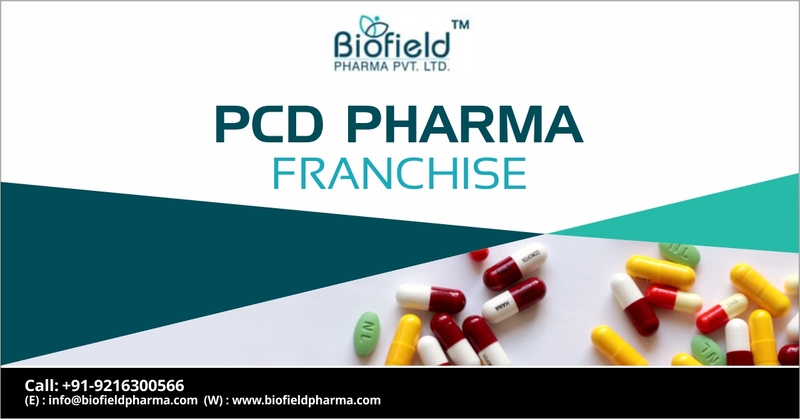 So If you want to start PCD pharma franchise in Chhattisgarh then collaborate with Top Pharma Franchise Company Biofield Pharma. This is the most trust-able name in the pharma Industry. We provide the 300+ varieties of medicines covering tablets, capsules, injectables, softgels, ointments, creams, drops etc. They are DCGI approved made using fine grade material and high-quality packaging technology. You can rely on for better quality drug formulations in the market. We are expanding our business opportunities to uncovered areas in center-east through PCD franchise in cities of Chhattisgarh like raipur, Bilaspur, Bhilai, Jagdalpur, Raigarh, Durg, Kobra etc. Medicines franchise is a good opportunity for all those who want a secured and genuine business plans. Chhattisgarh is a popular business destination as the demand for medicines is growing impressively. Biofield Pharma is the best pharmaceuticals company to bring you PCD pharma franchise in Chhattisgarh. You can collaborate with us through PCD franchise in specialized in therapeutic drugs like pediatric, dermatology, nutraceuticals, antibiotics, painkillers, multivitamins, anti-allergic, antiviral etc. For more information and details, you can call us at +91-9216300566, +91-9216300166 or simply connect through our live chat option. Else, leave a text message through contact inquiry form. We will be looking forward to hearing from your end. Our company promises you to deliver the highest quality medicines, better price rates, attractive incentives schemes and much more. Starting your business in the center-east state, Chhattisgarh is a good decision. The place has good exposure opportunities for all those who dearly want to start their own business. The healthcare sector is blooming under the direction of government. Good policies and rules have been introduced for the pharma businesses to let it grow immensely. The people are getting to know the benefits of investing in good medicines due to increases in life-threatening ailments. You will be offered monopoly rights to different locations of Chhattisgarh. Flexible deals are offered by our company in every district. The profit margin on sales is quite appealing. Those who want a profitable business can always invest in PCD franchise business. The company provides the strategic marketing support for the better business experience in pharma franchise. The wide area under your direct control is offered under PCD franchise by Biofield Pharma. Our company is connected with multiple healthcare professionals that will help in promoting the business. Tax Concessions can be enjoyed by our associates. By being a member of our company in Chhattisgarh, you welcome good benefits as PCD franchise owners. Our company is an esteemed pharmaceuticals company that deals with over hundreds of drug formulations. We specialize in manufacturing and marketing more than 300+ drug medicines and products. Our aim is the spread of better healthcare facilities around the nation. Our marketing services have been appreciated many times and many people are connected with us through PCD franchise deals. Quality Standards: We have our own Schedule M manufacturing units that are certified GMP-WHO units. Strict quality control and assurance regulations are used by the company. We have used fine graded ingredients and pure extracts to make each drug formulations. You can trust our company for better quality medicines and products. Latest Packaging Facilities: We always make sure that the packaging solution is the best in the market. You can always trust our company for the latest packaging techniques like Alu-Alu, blister packaging, bottle packaging etc. The containers used for packaging are hygiene and drug is packaging with air-tight technology. Best Research & Development Team: The backbone of the company is the human capital. We have the best experts and personnel in our R&D team. They have always supported our company by developing better and improved drug formulations by carrying different quality test, dissolution tests, accurate of composition, the efficacy of the drug etc. Our company always welcome hardworking and dedicated people who hold a strong conviction to start their business. In case you are an experienced and professional medical person looking for a good business then our company is the best choice. We have been providing genuine PCD franchise deals in India that bring you quality medicines at most reasonable rates. Our company has covered all the major places like Raipur, Bhilai, Durg, Bilaspur, Rajnandgaon, Raigarh, Korba, Ambikapur etc. We promise you flexible deals along with many benefits from the company. Contact us now to know about the current vacancy in your favorite location where you want to start your own business or look for expansion opportunities.